Hello and happy Thursday. One week until Thanksgiving! On the menu was: roasted turkey, honey-orange cranberry sauce, steamed broccoli, fried potatoes, and pumpkin pie with a graham cracker crust. 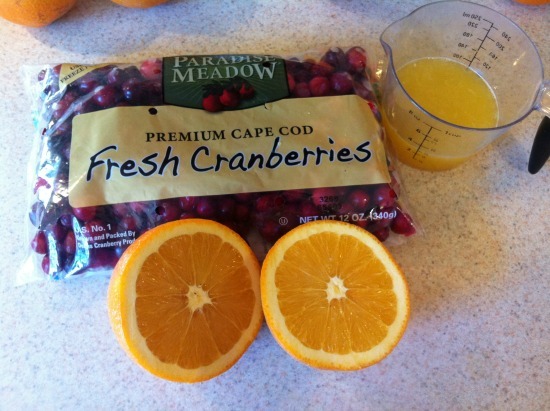 It was my first time making making homemade cranberry sauce, and I started thinking about different ways I could use the leftover sauce…. like in a peanut butter and cranberry sauce sandwich. Instead of PB&J, it would be PB&C. Yum! The pumpkin pie was definitely my favorite part of the meal, and I ate it before I ate dinner. Gotta eat dessert first sometimes! 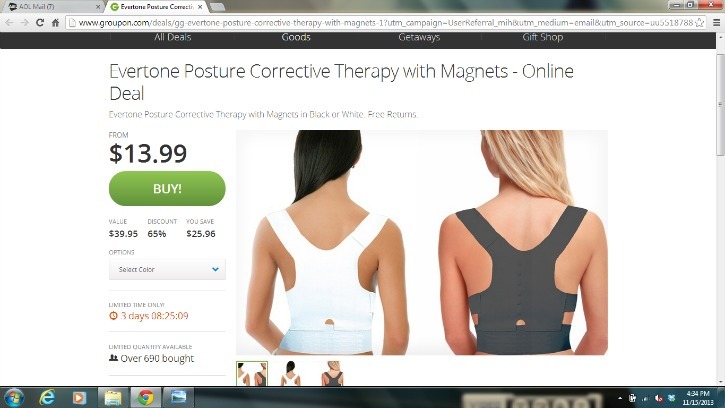 My mom emailed me this Groupon because she thinks I’m becoming Quasimodo (you know.. the Hunchback of Notre-Dame..). I will admit that I have really, really bad posture. I would probably gain about three inches in height if I stood up straight every once in a while. This ketchup = bomb. And by bomb I mean really good. I can go through a bottle of ketchup almost as fast as I can go through a jar of peanut butter (like two or three days..ha…). Gotta love Felix just laying on the floor in the background, haha. I would share more randomness, but I have a busy day of homework and projects ahead of me! I hope everyone has a great end of the week! Do you have bad posture? What’s your favorite Thanksgiving-esque food? Sometimes I think I do have bad posture. I do slouch a lot or sit around a lot instead of sitting up straight like I probably should. I think yoga helps a bit and I know I slouch when running, ugh. Probably why those super long runs wore me out so badly when marathon training. 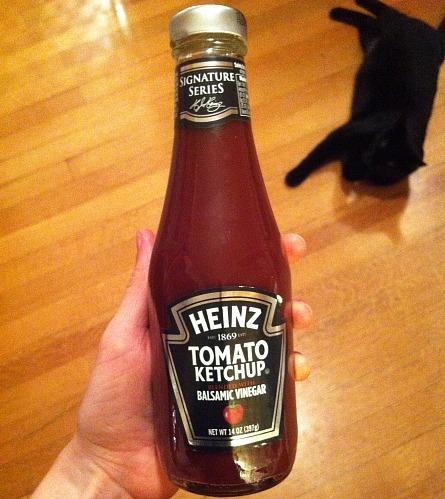 I’ve never seen that ketchup… I don’t eat ketchup at all but it looks interesting that you can buy it flavored now. I remember the green one back when I was in high school, hehe. Your pre-Thanksgiving test meal sounds and looks delicious! I’ll have to try that cranberry and orange sauce. Yum! I do have terrible posture! Did you buy the item with the Groupon?? If so, do you like it? I have the WORST posture and I definitely have an arch in my back because of how bad it is sometimes. Yikes. I’ve been working on a lot of “core strength” lately, though, and it seems to be really helping. I have to FOCUS on keeping my back straight and I really have noticed a difference with how much my back hurts some days! And homemade cranberry sauce is my FAVORITE. And I’ve never thought to put it on a PB sandwich! I think you just gave me a great idea!! You have convinced me to look at that ketchup. I saw it at the store the other day and I thought it looked pretty good but didn’t know if I was actually wanted to buy and use it. If it gets your seal of approval I must then! My posture needs some help :P. My dad’s always like “don’t slouch!” haha. 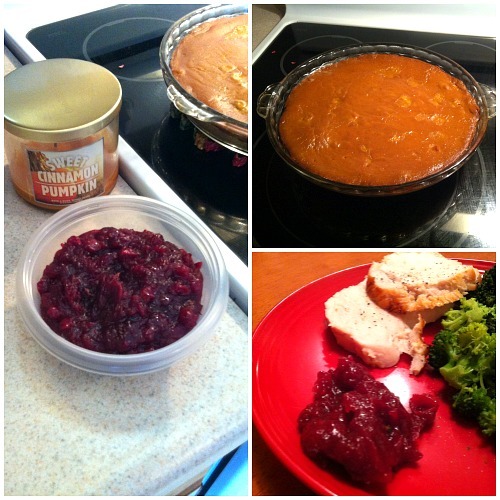 Jellied cranberry sauce and sweet potatoes! 🙂 yummmmmmmmmmmmmmmm! I sometimes notice myself leaning over, but I’ve gotten so much better!! Christopher has really terrible posture. He’s better now than when he was in college, but he loses an inch or two when he slouches easily!